Do you know what you’re wearing on Thanksgiving? Is your family casual? dressy? Or dressy casual? Are you are still walking into our closets saying, “I have nothing to wear,” like me? With a 100% vote over on Instagram for seeing more toddler friendly outfits, I figured turkey day was a great place to start! So, every outfit was pulled together with our life style in mind such a bending, lifting, hosting, socializing and of course, hugging our little ones. I even snuck in a few breast-feeding options in the descriptions below as we are in the maternity years after all. 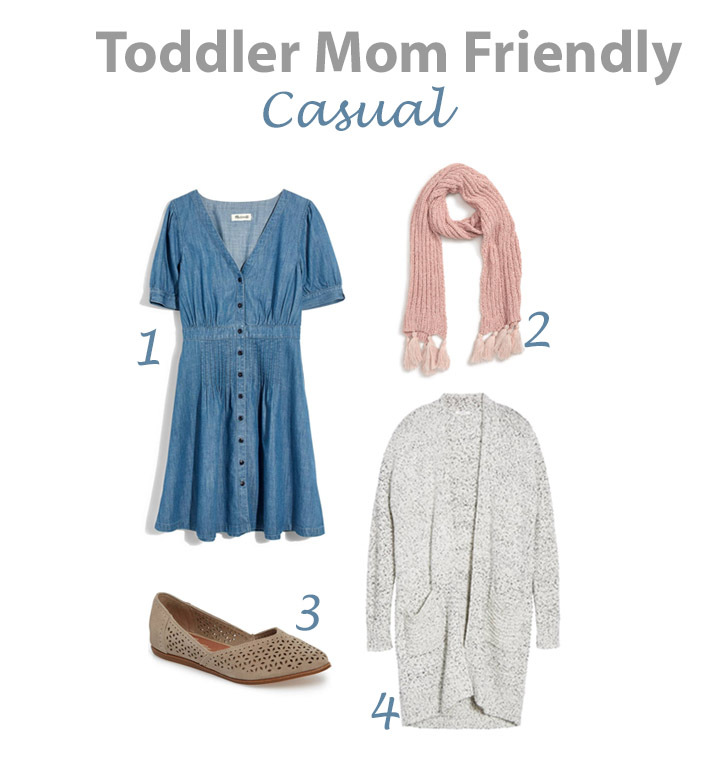 I hope you enjoy these three versions of Thanksgiving Day outfits starting with casual. Enjoy!! You never know if Uncle Johns house will be warm enough which is why I love a scarf and cozy sweater whenever I visit others. I love being able to throw this style on and off while also keeping a box's of raisin in my pocket for Abby at the same time. Pockets are always a win! I love the design and style of these! You could also wear them with black leggings and a white t-shirt for a warmer look and basically, as a mom, I can't live without flats! $20 for a good quality t-shirt is always a great find! I only own V-neck t-shirts because I love the long line a V-neck provides. Besides wearing my wedding rings or stud earrings, it's nice to wear something fancy for a special occasion, but nothing that will tear my ear lobes or neck (tempting baby & toddler toys). Having a comfy, stylish and flat pair of shoes is basically all I wear with my toddler around these days. Plus this style is great for the Christmas season too! 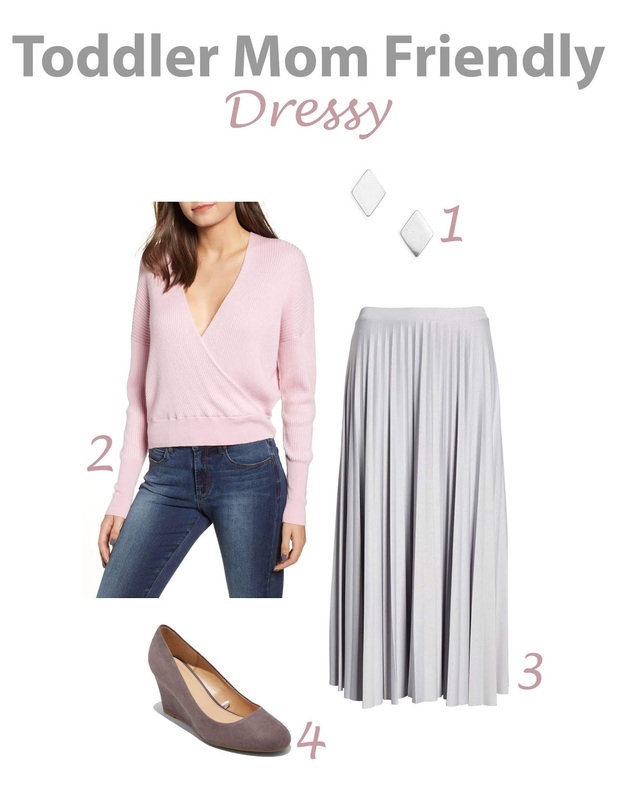 Pleated skirt designs are fairly pricy I've come to learn; however, I believe this piece is a classic, and would even pass to be part of a capsule wardrobe. 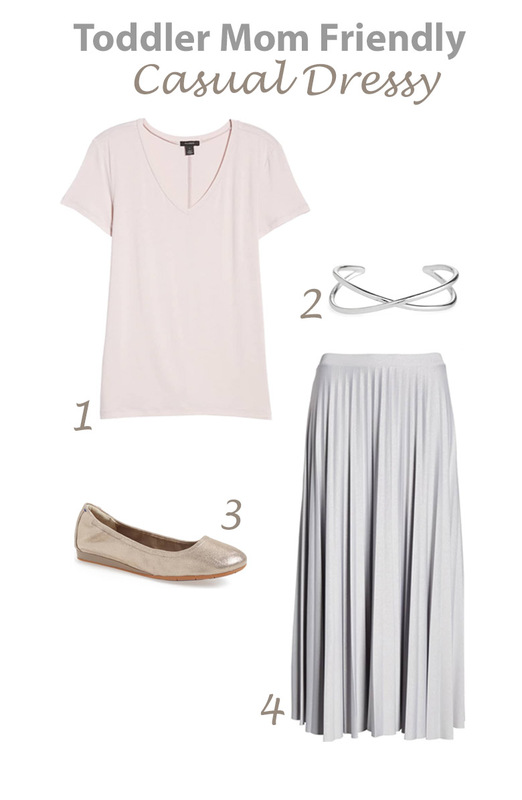 This pleated skirt is only $30 and almost exactly the same! I typically wear faux white pearl and or crystal stud earrings the last couple of years so it's nice to have something more casual in my jewelry drawer. Currently 45% off! I just ordered this one and I love that you can pull the V-neck to breast feed if that's the season of life your in. This one is also another great option for breastfeeding moms. Under $30! and this is only style of "heel" I typically wear, especially since becoming a mom. I feel dressed up, yet also solid on the ground. I just bought this pink winter coat for $35 dollars! And with promo code PREPARTY it's still on sale until today! If your size is sold out, here are some other options, and all under $100. I loved putting together these toddler friendly outfits!! Especially since it can be challenging to feel pulled together with little ones around yet, also so important for our self-care. I wish all of you have a very happy, relaxing, and joyous weekend before all the turkey madness begins!